St Mary's Church at Burwell is one of the finest Perpendicular church in Britain, a real symphony in stone, and a wonderful example of 15th-century architecture. There was a church here at least as early as the 12th century - bits of Norman work survive in the tower - the bulk of the building we see today is 15th century. St Mary's was under the patronage of Ramsey Abbey until the Reformation. After the abbey was dissolved by Henry VIII, the last abbot, John de Warboys, lived out his days at the parsonage in Burwell. 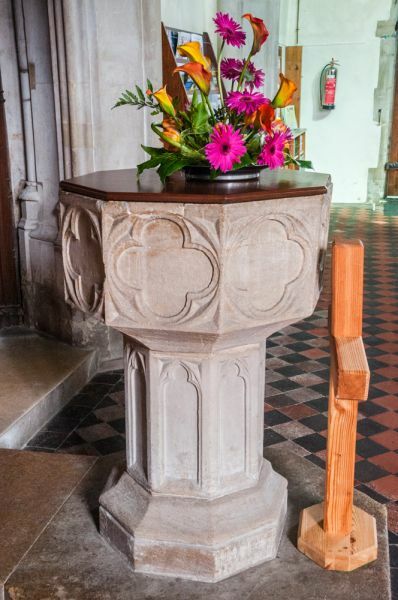 According to the terms of his will, he left a sizeable gift of money to the church, and he was buried in St Mary's, where a brass in the chancel floor commemorates his life. The church is composed of an aisled nave, a chancel with crypt, north and south porches, south west vestry, and a west tower. The material is a mix of stones, flint, and rubble, dressed with limestone, while the interior is of clunch. The tower is very striking, with an external polygonal stair turret at the southwest corner. The timber roof is carved with fanciful figures of gryphons, elephants, tigers, camels, eagles, and similar exotic beasts. It is clear that the woodcarvers had no real idea what the animals were supposed to look like, but the result is a delight. 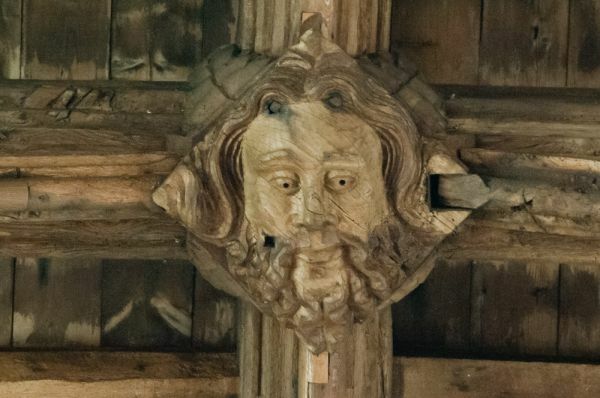 The roof of the chancel is a delicious piece of woodcarver's art, with wonderfully carved timbers and corbels depicting angels, saints, and earthly kings. 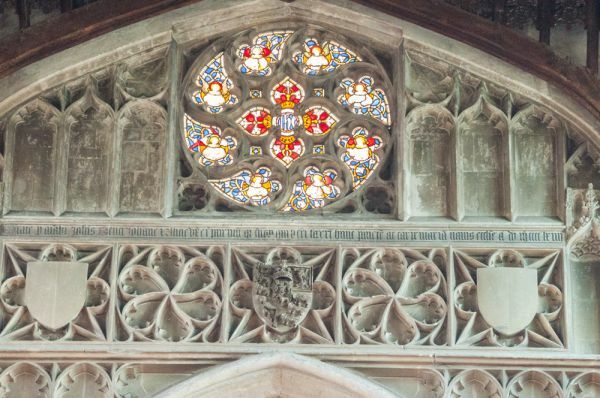 Over the north door is a large wall painting of St Christopher, but the feature that really draws your eye is a very large rose window inserted over the chancel arch, in a setting with wonderful Perpendicular blind arcading and niches. 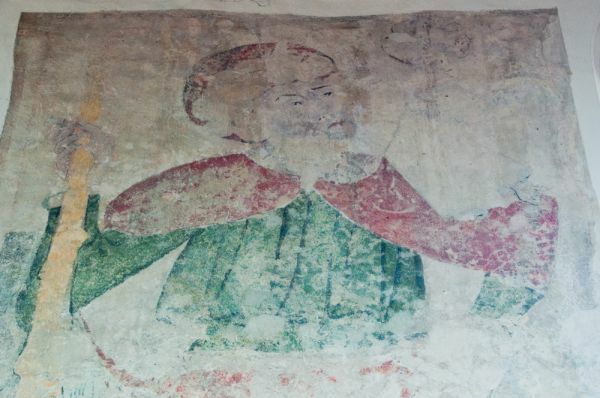 On the north wall is an early 17th-century wall monument to Thomas Gerard (d. 1613) and his wife (d. 1608). 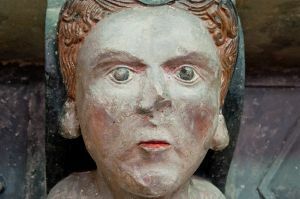 This is of alabaster, with beautiful scrolling and strapwork decoration. 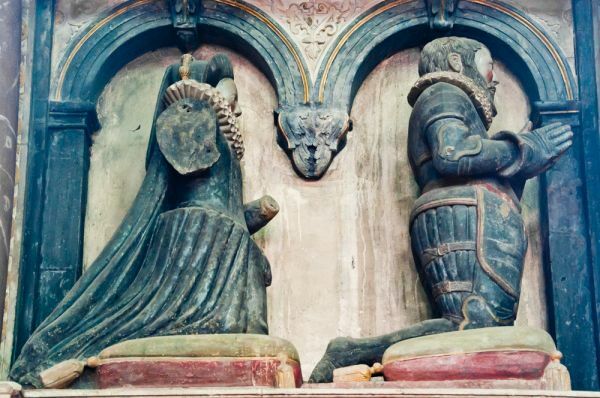 Perhaps unusually, the deceased couple to not kneel facing each other, but both look off to the right, as if kneeling before something out of sight. NB. 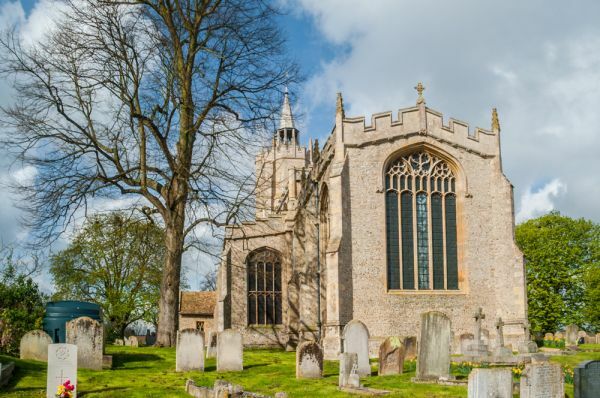 Don't mistake this Burwell church in Cambridgeshire for the historic church of St Michael's at Burwell in Lincolnshire.